It’s been two years since the last redesign of Facebook and now the time has come for a newly redesigned News Feed! The most popular social network is giving a new look to what is called the News Feed where you can see all the content related to your friends, pages you’re connected to and topics of interest. While the basic functionality are still the same, the design is completely new and focuses much more on visuals (You can see pictures below). What’s new also is the fact that the News Feed design will be the same on the PC and the mobile version which was not the case in the previous version. Moreover, The old “Facebook” logo will now disappear and leave the floor to a simple “f” logo. A new feature introduced is “The Switcher” and it will allow you to choose the type of content you would like to see on your feed going from News Feed to All Friends, Most Recent, Close Friends, Music, Photos, Games and Following. 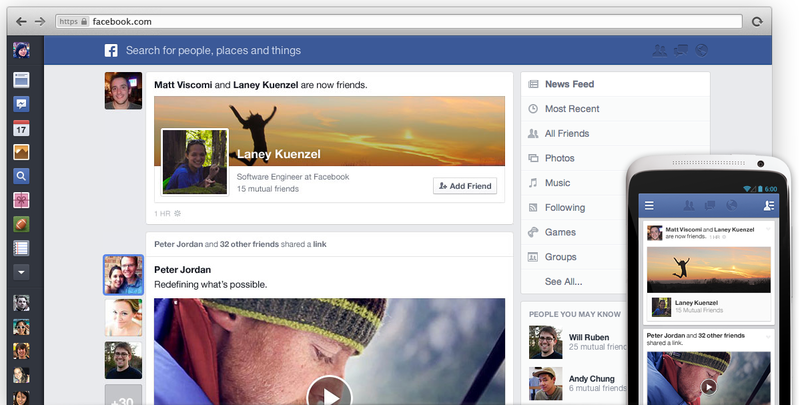 The Facebook team announced that the new design will also apply to ads and won’t affect pages in any way. The new design will start rolling out today, March 7th, and will keep on doing so until the next few weeks. (You can join the waiting list by clicking here). The billion users social network is doing its best to keep up with the latest trends in today’s world which are: More visual content and further mobile integration which are basically the two main aspects of this new design. There are some features that are still unclear, it is thus a bit early to talk about what this redesign means for marketers but, as part of their monetization strategy, it is expected that Facebook will always try to push brands, businesses and organizations to use promoted posts and run ads. So, do you like the new design?